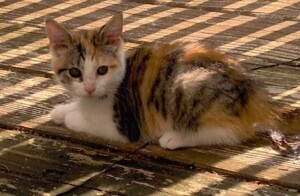 Candye is a 5 month old Calico. She was found in the woods abandoned with her sister and brother. I brought them home and nursed them to health. The other two didn't make it. She loves to run up and down the hallway and play with their adopted sister, Lacy. She'll play with anything that moves or rolls. Candye has grown into a healthy 5 month old and so sweet and very loving. She and her sister sleep on the bed with me every night and follow me around the house. Such a cutie. Thanks for sharing Candye with us. Good luck. Oh my gosh! She is so very adorable and I love her name! I'm so glad there's people like you! This picture looks just like my cat. She is beautiful. Thanks for posting. Candye's name is as sweet as she looks.